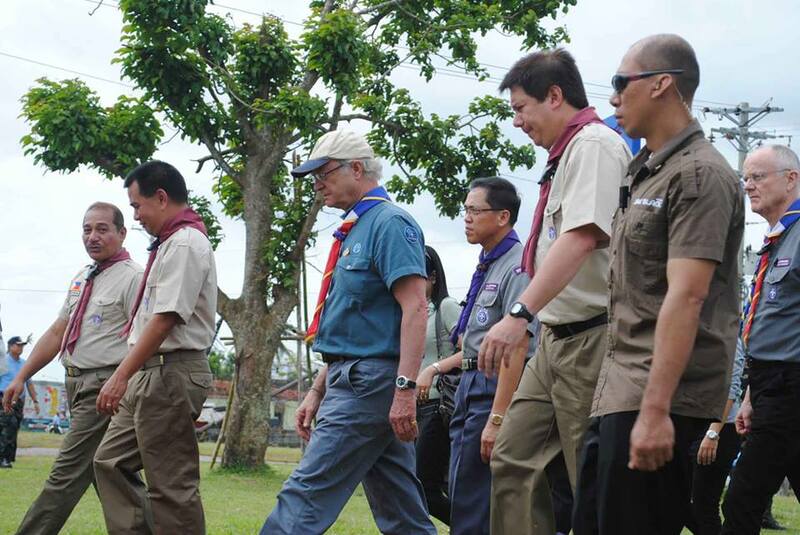 King Carl XVI Gustaf of Sweden gave his tribute to the local boy scouts during Yolanda during his January 26 visit in Tacloban City. In photo above, he was escorted by Leyte Gov. Leopoldo Petilla (left) and Tacloban City Mayor Alfred Romualdez at the Boy Scout Monument. TACLOBAN CITY-King Carl XVI Gustaf of Sweden paid his tribute to the “tremendous jobs” of the local boy scouts during the massive disaster during his visit this city. Gustaf, who visited this city on January 25 on board a chartered plane at around 9:18 am, said that he had heard stories that many of the scouts in this city and other affected areas by Yolanda made great efforts not only in ensuring their safety but even the members of their respective families. The king of Sweden, honorary chairman of the World Scouting Foundation and said to be one of the top donors of the scouting organization, personally distributed Boy Scout uniforms to 175 pupils, 75 at the San Jose National High School and 100 at the San Fernando Central School during his visits to these two public schools. The scouts lost their uniforms due to Yolanda. Leyte has about 28,564 members and 4,500 in Tacloban. “I am here in my capacity as a scout and I heard a lot of scouting in your country. (Also) I am here to see the destructions and many scouts did tremendous jobs here,” Gustaf, the first Swedish king to visit the country, said in a brief press conference held inside a huge tent of the United Nations. The king, accompanied by Boy Scout officials of their country, Simon Hang Bock, chairman of the World Organization Scout Movement and Vice President Jejomar Binay, the country’s national president of the BSP, walked from the tarmac to the tent. At least 276 boy scouts across the region, 20 them in Tacloban, died when Yolanda struck on Nov.8. The king said that one of the characters of being a scout- willing to extend help-came into play during the disaster. “Let us work together. I believe that’s scouts are good at because they know to help each other,” he said. The king accompanied by Tacloban City Mayor Alfred Romualdez visited the San Jose National High School where he gave a set of uniform, consisting of t-shirt, pants, belt and carabao slide, to 75 students. He also donated same items to 100 students at the San Fernando Central School and one of them was Jobez Timatiga. The Grade V student said that he felt “great” not only to see in person the king but to shake his hand as well. “I feel great to see the king. It was cool and his hands were so smooth,” the 10-year old boy said.